Recipe Shrimp Roll and How to Make Peanut Sauce .That you can try at home. The shrimp rolls were very tasty served at dinner with your beloved family. 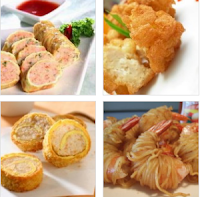 Its unique shape is simple with the nutrients of the shrimp and vegetables, shrimp rolls make this one of the favorite school lunch menu for the beloved baby. Yup ... now you do not get confused again to prepare their meals varied as shrimp rolls with peanut sauce extra this could be an alternative option. Combine shrimp that has been milled, sesame oil, carrots, starch, salt, pepper and 1 egg white. Stir well with a slam-slam until the dough becomes smooth. Spoon the batter into the top of bacon, then rolled. Take a dumpling skin, then cut into thin middle but not to break up, then apply a paste with egg white and roll of salami earlier. Edible oil above heat to dry and overcooked. Puree red chili, chili sauce, shrimp paste, salt, pecans and peanuts. Then tumislah with cooking oil to taste (about 3 tablespoons) until fragrant. Pour soy sauce and water, then cook until boiling and thickened. 0 Komentar Untuk "Recipe Shrimp Roll and How to Make Peanut Sauce"